Many moons ago I wondered how my social influence is measured as told in the post Klout Data Quality. Since then my Klout has dropped a bit from 59 to 57. It does not ruin my day, but I wonder why. A thing that strikes me is from where I get my Klout. It seems Twitter is the place as it counts for 73 % of my Klout. LinkedIn is only 8 %. Personally, I would give them opposite importance. Recently I noticed I was included in a list called Top 200 Thought Leaders in Bigdata Analytics. Honorable maybe. However, I am afraid it merely is a count of how many #Bigdata tags I have used on Twitter relative to others. What matters to me in social influence seems to be out of scope for Klout, as it is readers and comments on this blog. What about you. Do you have the right Klout? Is it measured the right way? 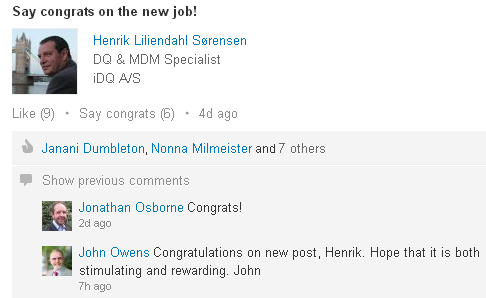 Recently I changed one of my job titles on LinkedIn resulting in a number of likes, congrats and messages. And thanks for that. Probably I have a record in a number of CRM systems out there where I am registered as a contact for an account with an attached job title. As a guy working at several places at the same time I am a bit complicated, I have to admit, so I guess many of these records aren’t up to date about where I work carrying what title and having what means of contact. Complicated or not, I have no doubt about that many CRM implementations will benefit from digging into social networks in order to be up to date and complete as told in the post Social MDM and Complex Sales. Within party master data management events may be captured during interacting with your (prospective) customers and other business partners, as an update from a third party reference data provider or in an increasing way by monitoring social networks which are often the first to know certain things, not at least when it’s about contacts in Business-to-business (B2B) activities. The distinction between IT and business is an often used concept in a lot of disciplines from Enterprise Architecture (EA) over data quality management to Master Data Management (MDM). While it may be a good concept to use when assigning responsibilities and finding out who should be driving what I have personally always kind of disliked the concept. It’s a concept practically only used by the IT side and in my eyes IT is part of the business just as much as marketing, sales, accounting and all the other departments are. 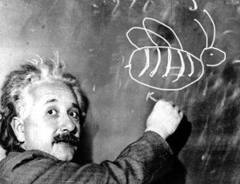 So, now when business is going social, how does that affect the IT and business distinction? Social business is in large parts done today in the enterprises around without involving the internal IT department. The use of data and functionality in social business done with so called systems of engagement is much more external focused than the internal focused nature of the traditional systems of record. However, if enterprises are to harvest the fruits of systems of engagement it must be done by linking the new systems of engagement to the old systems of record and that means involving internal IT. Please do this without dividing the enterprise into IT and business again. Please be more social this time.